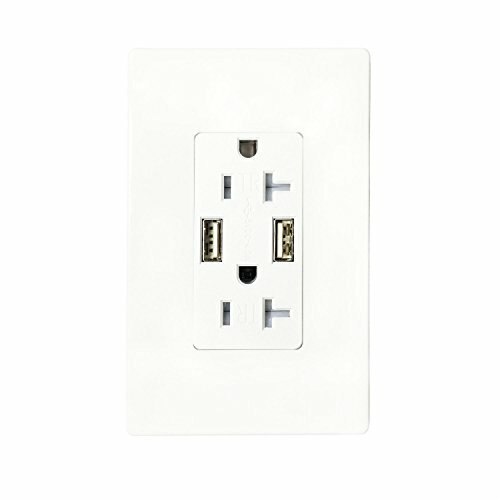 LASOCKETS 4 AMP 2 USB ports Charger Outlets, 20 AMP 125 VAC Tamper Resistant Outlets. In the absence of the adapter, the high-speed smart it can simultaneously charge two USB electronic products. • The output of 4 AMP in total is shared between two usb ports ,The built-in smart chip can be 4 AMP intelligent, fast, assigned to the two usb ports.There are also Receptacle Rating: 20A 125VAC, 60Hz output. • Tamper-Resistant: the security mechanism within the outlet for when a single tool inserted, play a role in helping to lock. Unless a double plug is inserted at the same time. this feature can prevent unnecessary insertion, for people in the use of improved security. • Output automatic protection: When the output is greater than 4.2 AMP, the outlet will automatically stop working. Unplug it first, and then reinsert it again to allow the outlet to resume operation. • Automatic Temperature Protection: less than 130 °F.When the temperature is greater than 130 °F, the outlet will automatically stop working until the internal temperature of the outlet returns to below 130 °F, will automatically resume operation. One of them is a wall panel with screw holes.The other one is a wall plate with no screw holes. • Easy to Install: The product package comes with a description of the installation,it is easy to install, especially for the novice.